Ansgar Eimann, born in 1969, studied choral conducting under Marcus Creed at the conservatory of Cologne as well as school music with his main subject being the piano under Arbo Valdma. Additionally, he completed private vocal studies under Lia Montoya-Palmen and Reinhard Becker. He was the artistic director of the student choral of the Friedrich-Schiller University in Jena and also responsible for several choirs in the Rhineland. 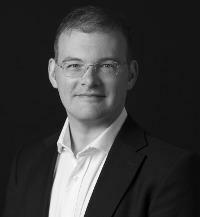 To deepen his expertise of choral music Ansgar Eimann joined several ensembles such as Kammerchor Stuttgart, Gächinger Kantorei Stuttgart, ChorWerk Ruhr, Rheinische Kantorei, Nederlandse Bachvereiniging and Klangforum Heidelberg. As a founding member of the ensemble Kölner Vokalsolisten he dedicates himself regularly to the choral repertoire of the 20th and 21th century. In collaboration with the German Music Council he designed and organised the framework program me of the German Choir competition 2010 and the German orchestra competition 2012. In the winter semester of 2013/2014 he worked as a lecturer for syntax at the Institute of Linguistics, Media Studies and Musicology of the University of Bonn. Further, he is cantor and organist of the Old-Catholic Parish Church St. Cyprian. Since the summer semester 2014 he is directing the choir of the Collegium musicum Bonn.